Fritzi Marie: What'll Ya Have? How was your weekend and your Mother's Day? I hope it was magical. We've been busy getting Dan ready for a trip to Seattle and a visit from my parents. Today we drove to Atlanta to drop Daniel off at the airport and pick up my Mommy and Dad CJ. 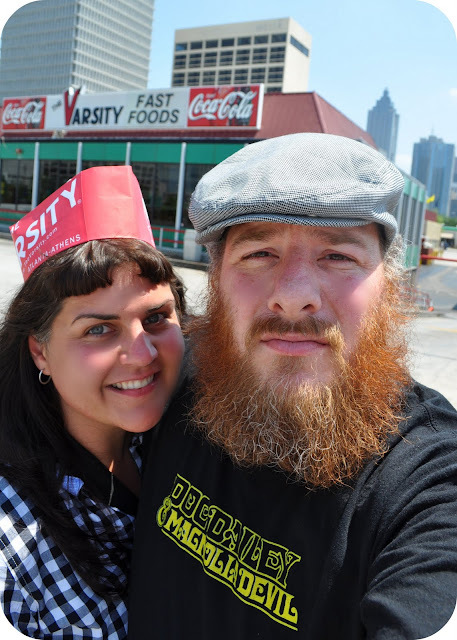 While in Atlanta today, Dan and I had spent some time shopping and visiting The Varsity. My Daniel loves a good hot dog! YUMMO Pretty Kitty! I'm so jealous! 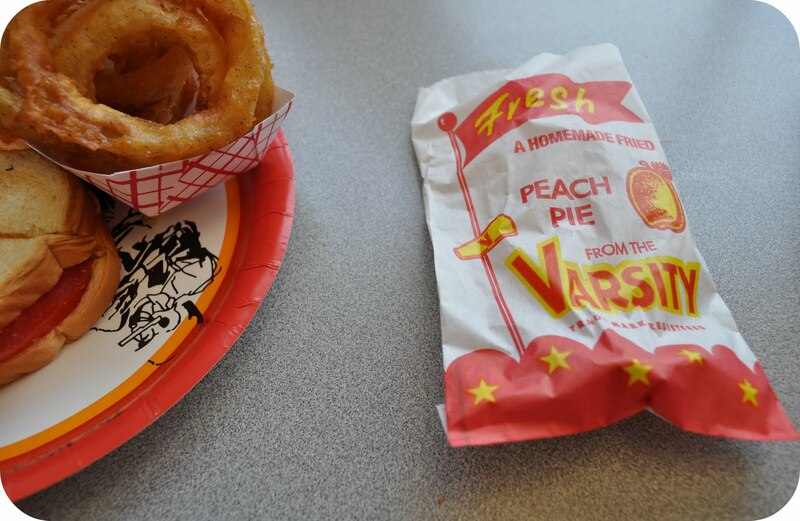 I'd HAVE to have a chili cheese burger & onion rings with a sweet tea and peach pie! drools! The thing I miss most is sweet tea. I drink it by the gallon when I visit home! How far is ATL from Auburn? We're about 2 hours from Atlanta. It's the closest "big city" to us. We go there to get our Anthropologie, Sephora, Macy's, and Trader Joe's fix. Dan loves The Varsity! He always wants to stop in for a hot dog. I love the packaging and the nostalgia of it all. I hope you are well, dear friend. Here's to fabulous treasure hunts. you guys look amazing! and tell dan that mark is a man after his own heart when it comes to the hot dog love. we adore the varsity. me, i want to borrow either yours or dan's hat to cover up my awful hair!!! have a fabulous visit with your mom. missing you. sending you tons of love and hugs. Oh my that looks like my kinda place my friend...peach pie..so darling. xoxox hugs to you. 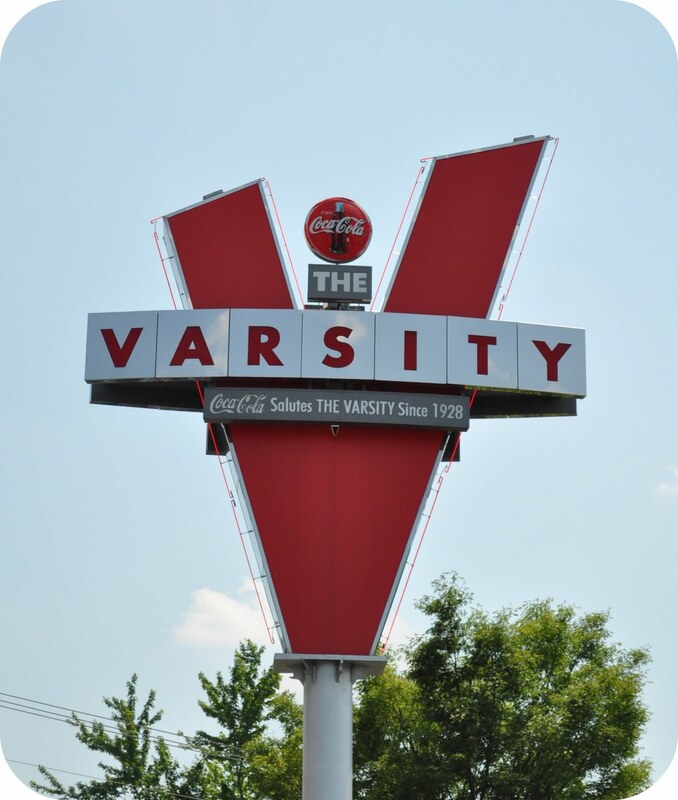 Growing up as an Atlanta native, the Varsity is my least fav place to eat. We used to call it the grease bomb. I really do love the orange cream shake though, but you can keep the burgers. I will always be a Chick Fil A girl myself. In Atlanta, Truits is a sit down fancy version of Chick Fil A. I have great memories of going through the dwarf door at the first Chick Fil A in Atlanta (Hapeville). I guess you are a Chick Fil A girl the same way that I am an In N Out girl. My thing with In N Out is that I think it is only good when you go to one in Southern California. The other one's just don't seem right to me. 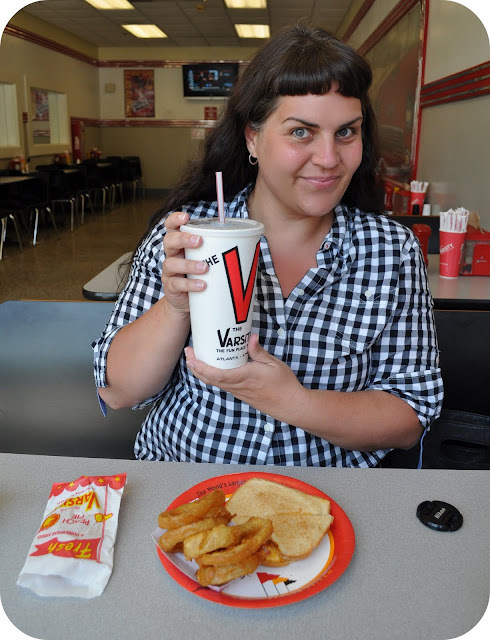 I don't eat red meat so I really couldn't tell you about the hamburgers at The Varsity but the do have great ambiance and Diet Coke. I think it is a really fun place to visit and I love to take people there. It is a must see, that's for sure. dearie, i finally got around to posting our wedding photo play date! oh atlanta... did i tell you my husband went to Georgia Tech just like his Papa? and when i went home with him there Varsity was a place i was glad to have experienced! in fact, i bought a shirt while there ;) but i didn't look nearly as cute as you did in your hat! Next time you are in Atlanta, my mom says that you have to check out Ted Turner's restaurant (Ted's) that specializes in range bison. Dan might like it. He seems pretty adventurous when it comes to food. Dad says that the buffalo meatloaf is divine. Also, every time we would drive to Atlanta (around Birmingham) we would stop by a grocery store and grab a 12 pack of Buffalo Rock Ginger Ale. Holy Cow that's good stuff! And, DO check out Little Five Points in Atlanta. It's an artsy second hand shopping area. You would love it! Atlanta is really my stomping ground. Jack always makes me drive in Atlanta traffic because it makes him want to cry. Love you guys! Jack was just saying this morning how you and Dan are eternal tourists, always discovering gems in your own town.